Create a lasting Memorial Keepsake the entire family can enjoy with our Personalized Memorial Cross. This Cross provides you with the most beautiful reminder of someone who has passed one. 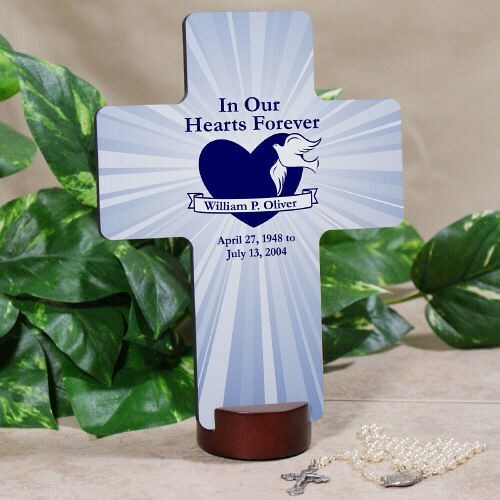 Your Custom Printed Memorial Keepsake Cross measures 6 7/8" L x 5 1/4" W. Wooden cross stand is included with every Memorial cross. Personalize your Memorial Photo Wall Cross for free with any name, birth date and at rest date. Additional Info At MyWalkGear.com, we offer many additional Personalized Memorial Gifts that are suitable for remembering a loved one who has passed. Be sure to also take a look at our Engraved Memorial Ornament & our beautifully Embroidered Memorial Afghan as well.